Appreciate the opportunity to speak at the MBA's inaugural Small Balance Lending conference in Chicago last week as part of a great panel session on market trends. 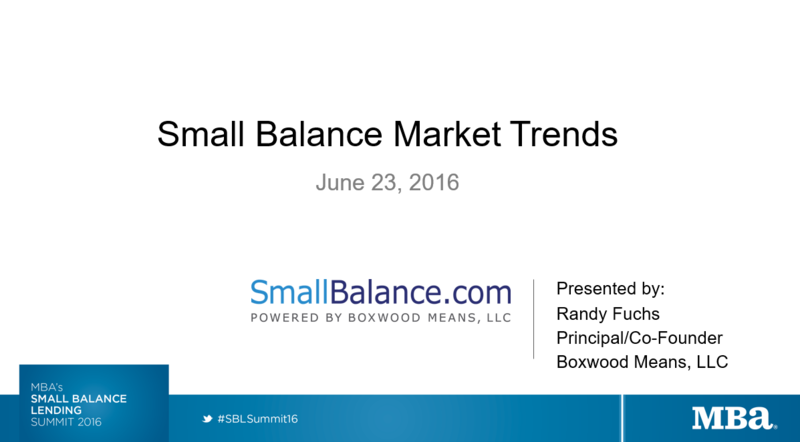 I [Randy Fuchs] likened the event to a 'coming out' party for the small balance market and its participants after years in relative obscurity, and I'm grateful that MBA stepped up to the plate and made it happen. We foresee another banner year for small balance lending; first quarter commercial/multifamily loan originations were $40 billion according to Boxwood's preliminary estimate, on par with Q1 2015 which turned out to be a record year with loan volume totaling $181 billion. Sam Chandan of Chandan Economics reported that first quarter small multifamily loan originations were up 15% YOY as Agency lending in particular continued apace. Jim Going, CEO of ReadyCap Commercial, suggested that the competition for loans was as fierce as ever, but that the overall size of the market - as well as its fragmentation - continue to be irresistible opportunities for lenders of different stripes. The primary reason for our own favorable outlook on lending is that core fundamentals remain very strong: at the national level 20 consecutive quarters of positive net absorption; small-cap vacancies at record lows; little supply pressure (in contrast with the large cap CRE market); and escalating rents (e.g., industrial rents were up an unprecedented 6% YOY during Q1). As a result, small cap property sales are again on a record pace this year, and positive sales price momentum persists. Also, it doesn't hurt that the GSAs have created a remarkable marketplace for small balance multifamily loans, and their seller servicers like Arbor, Hunt, Sabal and others are making it easier than ever to originate loans online. My presentation slides can be viewed here; the MBA will be posting presentations from all panelists on the MBA website.